When on your Florida Keys vacation make sure to spend some time at the amazing parks and beaches available to you. Marathon boasts some of the nicest beaches and parks in the Florida Keys. From Bahia Honda to Sombrero Beach, Marathon and the Florida Keys have a beach that is perfect for you. Beaches aren't the only thing that the Florida Keys is famous for. Discover, explore, and enjoy a beautiful day with the family in one of our many inland parks like Oceanfront or Marathon Community Park. Below is a list of the top beaches and parks found where you'll be staying in the Florida Keys. Coco Plum Beach is a natural beach with an adjacent wetland located in Marathon, MM 54, 1.4 miles down Coco Plum Drive. This beach is typically less crowded and provides a covered pavilion and restrooms. Coco Plum Beach is one of the only completely dog friendly beaches in Marathon and is perfect for letting your four-legged friends burn off some energy and enjoy the ocean. The waters are shallow so it is not the best beach for swimming but the long, beautiful stretch of beach is perfect for a walk with stunning sunsets. Due to the shallowness of the water Coco Plum Beach is also ideal for windsurfing. Beach hours are 7 am until dusk. Have some fun in the sun at Sombrero Beach; a beautiful, family oriented beach that features a shady park with picnic pavilions, volleyball courts, restrooms, showers, and full handicap accessibility. Sombrero Beach is a turtle nesting beach and from April through October it is not unusual to have Loggerhead turtles, among other species of turtles, coming to the beach at night to lay their eggs. During this period we do not have tables or benches on the beach so we do not interfere with turtle nesting activities. If you are interested in helping with this lovely obligation please get in touch with us. F.D.E.P. holds classes in February or March every year to be a state certified surveyor. The City then schedules all of the surveyors for their day to walk the beach. Walking the beach first thing in the morning looking for turtle nests is an awesome experience. Sombrero Beach hours are from 7:00 a.m. until dusk and is located by MM 50 at the end of Sombrero Beach RD. The Club offers: A Private Sandy Beach on the Atlantic Ocean: Impeccably maintained, this span of private beach is a perfect place to lounge under a palm tree, soak up the tropical sun or to play in the Atlantic Ocean. 65` Heated/Cooled Pool: For those who don`t care for sand or the salt water "Cabana Club" offers you a 65` long crystal clear heated/cooled pool that awaits you during those long hot days of summer and those cool evenings of winter. Dining: We now have several ways you can enjoy the menu at the club. We offer cabana servers (Order your favorite cocktail or a full meal while relaxing in your lounge). If the sun is to much retire to the airconditioned diningroom or visit the lounge for all your food and beverage needs. Lounge: This lounge offers a full selection of adult libations and an ample selection of frozen smoothies for the kids. Be sure to take a few moments to browse through our photo albums and gander at the many of our favorite shots hanging up. You`ll see the years of fun and memories that have made the Cabana Club what it is today. 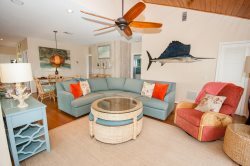 In the lounge you`ll also find two flat screen TV`s and a big screen TV for your favorite sports, weather or news, a book lending library as well as a place to get all those little necessities for your day at the beach. Sunscreen, Towels, Cabana wear, Island Art, Snacks, Chips and Ice Creams Lots of Lounge Chairs: We offer lounges throughout the club areas. You can always find the one that`s right for you. However, we do ask that you do not save lounges for individuals that are not on premise or relocate them to the beach. We also offer: Shower and Changing facilities, Complimentary Ice Water, Lap Swimming, Water Aerobic Classes, Swim Lessons as well as host a Swim Team. Please Call the office for more information on these activities. A Membership or "Guest Privileges" is required for admittance to the club. Be sure that your rental includes "guest privileges" so you can enjoy your vacation to it`s fullest. The Island of Marathon, located in the heart of the Florida Keys, offers pristine natural beauty and an array of stunning and unique wildlife year long. Take a drive down to Bahia Honda State Park, located at mile marker 37, and enjoy the award winning beach or stay for the sunset at the historic Bahia Honda Bridge. This skate park is located on the east end of the City Community Park located near 35th St and is visible from the Highway. Participants must sign in and out and safety equipment is required. This park is FREE to use. This park is located at 7575 Overseas Highway (corner of the Overseas highway and 75th Street ocean side). It is an awesome child playground built through the ground roots efforts of Marathons Rotary Club and volunteer efforts. This is a 3 acre park that has wooden playground of swing sets, lookout towers, Thomas the Train, Captain Hooks Ship, tunnels, slides, a toy shark, and a toddler only area. There is a large picnic pavilion with tables, as well as picnic tables located throughout the park, and restroom facilities. This is a great place to hold a childs birthday party. They have a small enclosed area for your dogs to run in safely too. Surrounding the playground is a beautifully landscaped park. Hours are 8:00 a.m. to dusk. In 2009 a group of dog lovers, Friends of the Dog Park, came together to raise funds for a dog park at Rotary Park. The area next to the Rotary Childrens Park (between 75th and 76th Streets Oceanside) is designated for your four legged friends supervised off-leash dog play. There are separate areas for large and small dogs. Simple rules are posted at the park for everyones enjoyment of the park. The park is open from 7:00 am until dusk daily. Fido gives it two paws up! The City of Marathon is filled with natural treasures such as Sunset Bay Park on Grassy Keys gulf side (Morton Street and Kyle Avenue). Comprised of three lots, the park also has an upland hammock of vegetation. While wandering among the growth several species of palm can be identified. Native species of Gumbo Limbo, Poisonwood, Sea Grape, Mahogany, and Mangrove (white, black and red) provide habitat for crabs and songbirds. White Crown Pigeons make there way in to feed on the Poisonwood berries; Hawks and Vultures patrol the sky; Osprey whistles can pierce the silence or the steady beat of a woodpecker can set the pace for the songs of the Mockingbird and Cardinal. Humming birds flit across and through the undercover checking out the flowering vines of the area. Private, gated beach located in Key Colony Beach between 10th and 11th Street. Enjoy a sliver of paradise on this pristine, private and gated beach in Key Colony Beach. Inch beach has parking, bike racks, a tiki hut and fresh water for a shower all on a sugar sand beach with crystal clear water. Only available with select Key Colony Beach Vacation rentals. This park is located directly on U.S. # 1 at 200 36th Street Ocean (MM 49). There are four tennis courts, a tennis wall, a combination hockey/basketball court (3 courts), two little league fields, and two soccer fields. There is also an X-treme skating park, two shuffleboard courts, two bocce ball courts, a batting cage, concession stand, amphitheater, picnic areas, and restrooms. This facility is handicap accessible. The park hours are 7:00 a.m. to 10:00 p.m. Funded by a grant from the Monroe County Tourist Development Council and built by Coffin Marine Services, Inc, located behind City Hall at Oceanfront Park. On the westerly canal, the kayak facility consists of two covered tiki huts linked by a boardwalk, with a ramp down to floating docks which feature two kayak slips for easy launching and access to the Overseas Heritage Paddling Trail. Ample parking is available, including a paved handicapped parking pad.